A little more than a year ago, on the day after the GOP regained control of the House of Representatives, Speaker-to-be John Boehner said one of the first orders of business after he took charge would be the repeal of health care reform. Boehner is not the first nor the only Republican to try to make us believe that the U.S. has the world’s best health care system and that we’re bound to lose that distinction because of Obamacare. I’ve heard GOP candidates for president say the same thing in recent months, charging that we need to get rid of a President who clearly is trying to fix something that doesn’t need fixing, something that isn’t broken in the first place. Well, those guys need to get out more. Out of the country, in fact. They need to travel to at least one of the many countries that are doing a much better job of delivering high quality care at much lower costs than the good old USA. 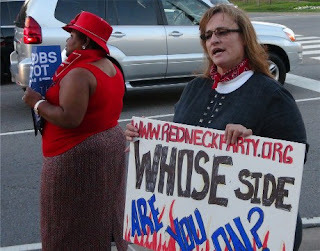 Jeana Brown of Redneck Party: "Whose side are you on?" SPARTANBURG, S.C.---"The South shall rise again!" will be the rallying cry of the Southern-based workers' rights Redneck Party and the Beer Party when they picket the Republican presidential debate beginning at 5 p.m. ET Saturday Nov. 12 at Wofford College. Though whimsically named, the Redneck Party and the Beer Party are dead serious about waking up Southerners to who is behind their loss of jobs, homes, income and quality of life. "We want to run these cheap-labor conservatives back home," said Jeana Brown, co-founder of the Redneck Party, a pro-labor coalition. "We want folks across the nation to know that we in the South might be so-called 'right-to-work’ states, but we know right from wrong. Taking away collective bargaining rights of teachers and fire fighters all over America is wrong.